The Eurotherapy Classic cyclo massager – see it at over 50 events across the UK and try it benefits out for yourself on a whole range of common health conditions. The Eurotherapy Classic is a professional quality cyclo oscillating pad massager, designed by German engineers and health experts to bring the benefits of professional physiotherapy to the home. FREE UK delivery. Weighing just 1.4kg (3 lbs) with a sturdy 1.3kg carry case, this lightweight, robust product comes with an optional heat setting which quickly reaches 40°C for gentle localised muscle and soft tissue therapy. 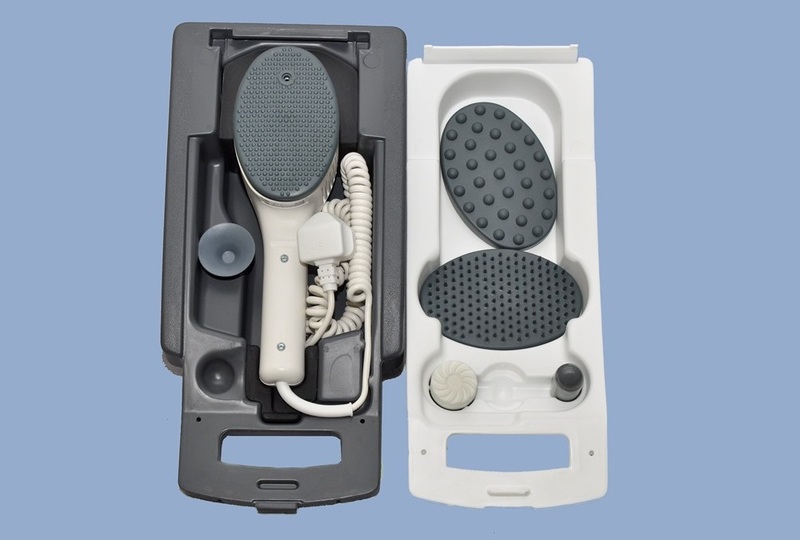 With the product placed in the lower half of its carry case, this allows for easy self-massage and comfortable hands free treatment of your feet, shoulder, upper or lower back, hip, thigh or knee. The carry case will hold the Eurotherapy Classic securely in a number of positions whilst allowing you to continue with your normal activity of watching television, reading or handicrafts. Having a balanced ergonomic design allows convenient one-handed use and a range of accessories tailor the treatment to your requirements. The powerful 45 Watt motor oscillates at 2,870 rpm and yet is quiet enough not to become intrusive. A variety of attachments allow for a range of therapeutic uses from scalp, reflexology and cosmetic soft tissue use to deep penetration massage. The soft bristle pad and ball studded reflexology pad, both attach by simply placing them over the base plate and allowing the sides to locate in a groove. The cosmetic sponge, soft bell, and domed deep penetration attachments, all locate in a high quality stainless steel threaded insert in the base plate. The coiled power cable stretches to a length of 3 metres for convenient use without having to be immediately next to a power socket. When not in use the power lead will recoil to its original length. Weighing only 1.4 Kilograms, the Eurotherapy Classic is light enough for easy transportation, yet sturdy enough to provide effective use. Its convenient weight does not impair its performance as many professional users will attest. A useful hand grip is molded into the front of the product for two handed use should you require the services of an assistant. This is also a feature particularly appreciated by the qualified Physiotherapist. If you would like to find out more please contact us or visit us at a show near you. Every time I have seen you at show Peterborough, Grand Designs Motorhome show I have approach the JOHNATHON WOOD in front of a demonstration and told the customer how good the machines are! (hope they don't think I am a plant) but the truth must be told. I used to work with (Pneumatic) drill and rattled the joints in the old body now 71 years old and can swim 65 lengths of a 25 mtr pool every day … the machine works for me! Fly a Spitfire for my 80th birthday! I thought you would like to know that the unit I bought fifteen years ago is still going strongly. It has kept me fit enough to sail my boat, mostly single-handed, all these years, and to fly a Spitfire for my 80th birthday. Yeeeeeeeha! Come to think of it, that's less than £27 p.a. And less than £2.25 p.m. Not bad! Your hand massager was the best investment I ever made. We have had many tests and numerous treatment done and spent lot of time and money but all in vain. Your massager was the only one which helped my wife. I also find it very useful in relaxing my legs after a day’s work. I am on my feet for over 13 hours every day. I was at the motorhome and caravan show a couple of weeks ago and was hobbling past your stand. I am so far very impressed with the effect it is having on me. I have recommended the product to several people and am very pleased with my purchase. It is now 6 months since I bought the Eurotherapy Classic hand massager, I wanted to tell you what it has done for me. The short answer wold be that it has prevented me from buying a walking stick. Osteoarthritis led to early retirement in November 2007 … now I can be on the go all day, every day. It is a great machine and has helped tremendously. We have told lots of our friends. Angela set up a program for me and I did this for the first fourteen days as advised. I am now using it twice a week once again as instructed. No one claims this will ever cure me and I am still on medication (no one claimed this would ever change) but life is certainly much more bearable. There were days when I could not go out or had to come home early. No keeping me in now my husband and family can’t believe the transformation in me. It is lovely to be able to move my fingers and legs more freely. I was delighted to meet you at The Cotswold Show to discuss the use of my Biocomfort [previous brand name] machine which I purchased many years ago. You showed me how to use the various attachments correctly and I am so grateful to you for this and for the programme you gave me to follow. I have followed your recommendations daily. It is lovely to be able to move my fingers and legs more freely. I am 37 years old and have Ankylosing Spondylitus. I have been using my Euro therapy classic for nearly a year now and have found that it helps me very much. I would recommend it to anybody else who suffers with arthritis. I purchased my classic about 3 years ago as I had been diagnosed with arthritis in my knees. I now only need sticks to help me on the steepest inclines and can happily walk my dogs for 2-3 miles with no discomfort. I am amazed the doctors do not recommend this … there are no side effects, it takes minimal effort and is so effective. I have recommended the classic to a number of my friends who have similar knee problems. I purchased my machine on 21st Sept 2011. I can now jump off of the boat onto a pontoon without difficulty and climb up ladders, walking up and down stairs does not create any difficulty or discomfort, and I can transfer weight through both legs instead of hobbling about transferring weight through one leg. You gave me a practical demonstration for about 10 minutes and while I walked round the show I realised that my back felt much less tense. To be honest, I was a bit daunted by the price but as I could feel a difference I decided that I would give it a go … I am now able to spend hours, not just minutes doing my beloved garden and if I do over-do it I can get my hubby to run the massager over my back! The Eurotherapy Machine has made a tremendous improvement. Two years ago I had a small foot operation. The surgeon was confident I would make a full and fast recovery and be back in killer heels within a few weeks. Sadly this did not prove to be the case … the Eurotherapy made the most miraculous difference and I am so grateful to have found it. Separately I have also found so many other ways that this machine can help. It is quite astonishing how quickly it works. I think it is a marvelous massager and indeed pin all my faith on it. I heard about this equipment through one of my patients with a long-standing back problem. I have since used it on my own patients with considerable success. My wife who is a physiotherapist has also found it extremely useful. Just a few words on the excellent massage machine I purchased from you at the Ideal Home Exhibition. The unit has been really good. Also Rosemary was also really impressed with the results. It was well worth the outlay. Just really pleased with the unit and its results. As a sufferer of Rheumatoid Arthritis, I know that there is no such thing as an actual cure … my arthritis is in my hands and wrists. Well here I am exactly 2 years later and what do I have to say about this machine now? I can’t praise it enough and would thoroughly recommend it to anyone who suffers with arthritis. Just wanted to say how pleased we are with our Eurotherapy machine, it is now some years since we purchased it from you, in-fact we were still living in the UK so it must have been 2007. It has certainly sorted out Ivan's back problems, which was a great relief for him, we have also loaned one to a friend who has arthritis in her knees - we cannot recommend it highly enough! Hope you had a good and successful show - probably see you next year.